Kumamoto Prefecture (熊本県, Kumamoto-ken) is a prefecture in the Kyūshū region of Japan on the island of Kyushu. The capital city is Kumamoto. The area of Higo Province was renamed Kumamoto during the Meiji Restoration. Kumamoto Prefecture is in the middle of Kyūshū The western border of Kumamoto is the Ariake Sea and the Amakusa Islands. Fukuoka Prefecture and Ōita Prefecture are in the north. 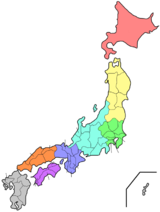 Miyazaki Prefecture is in the east. Kagoshima Prefecture is in the south. Mount Aso (1592 m) is an active volcano in the eastern part of the prefecture. ↑ Nussbaum, Louis-Frédéric. (2002). "Kumamoto prefecture" in Japan Encyclopedia, p. 572; Japan External Trade Organization (JETRO), Kumamoto Prefecture, Regional Information; retrieved 2012-4-6. ↑ Nussbaum, "Kumamoto" at p. 572. ↑ Trends in Japan, "Kumamoto, Famed for Its Castle and Caldera"; retrieved 2012-2-7. ↑ Nussbaum, "Shimabara no Ran" at pp. 857-858; Visit Kumamoto, Kumamoto history; retrieved 2012-2-7. ↑ Nussbaum, "Aso-san" at p. 58. ↑ "Nationwide List of Ichinomiya," p. 3; retrieved 2012-2-7.